Today, Bristol Wedding Planner, Steph Allison shares another wedding trend with us. Today it's rustic chic and you can get more great theme ideas from her Pinterest inspiration boards here. Rustic weddings seem to featuring more and more recently and it's a trend that is mainly coming from America. Modern rustic weddings combine natural elements like wood, linen and natural looking flowers with stylish design elements. For a rustic venue think farms, barns or an outdoor space like an orchard. This great venue is from my board on Pinterest. Lighting is important for a rustic wedding and for this think strings of twinkly white lights, hanging lanterns or dancing candle light. Softly draped fabrics make a great contrast to rough wooden textures. Hessian, burlap and rough linen work well as does a softer lighter linen fabric to make floaty white curtains for a romantic feel. I really love this rustic dessert table. The combination of floaty curtains, wood and fairy lights totally nails the key elements of the rustic look. This is from a goregous Californian wedding on the Ruffled Blog. 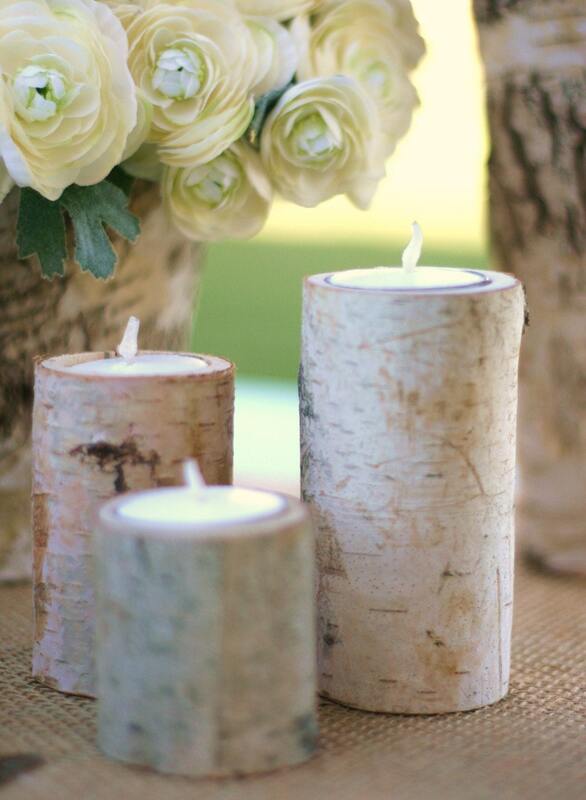 The images below are from Bragginbags shop on Etsy that sells the wooden planters and lots of great rustic accessories, like the fabulous birch bark candle holders. The table also looks great with white cloths and burlap table runners. Rustic weddings have a certain home made, back yard feel. Drinks work well left in glass bottles or served in jam jars, as below. Home made favours also add to the charm like those shown below from Style Me Pretty. When it comes to the cake, cheesecakes work fantastically as a change from the traditional fruit cake. Serve the cake on a log base for a truly rustic look. This cake by Kima Konfections was from a rustic farm wedding in Passadena, USA. Bouquets like table decorations should look as though they have just been grabbed from the garden. This gorgeous rustic bouquet from A Mountain Bride Blog. Finally these photos from a Style Me Pretty wedding demonstrate just how stylish rustic can look if done properly and they have got is spot on in this rehearsal dinner inspiration shoot by Tying The Knot Wedding Coordination as shown on Style Me Pretty. Click the link for more gorgeous images. I hope this has given you some ideas for your own rustic wedding. There are lots of great barns and farms locally where this look would be fantastic. If you need any help planning your perfect wedding, please do get in touch. Lovely article with some great images. For more barn ideas and suppliers I am organising a wedding fair at the barn at Over Farm, near Gloucester - it would be great to see you there!